What is another word for procedure? 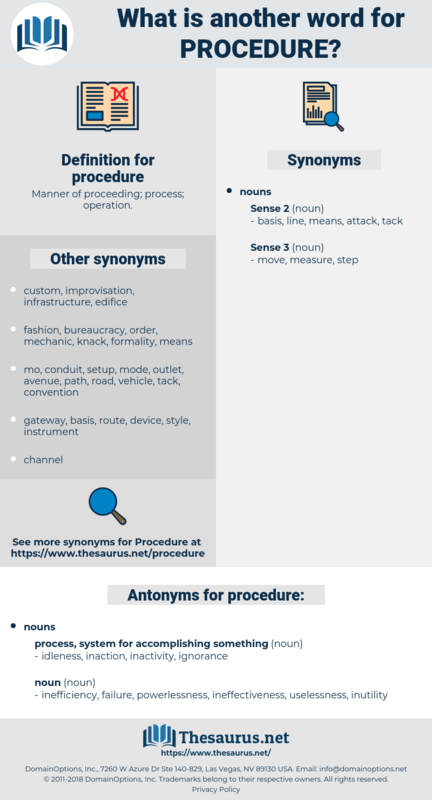 Manner of proceeding; process; operation. reports, RS, Guidelines, sites, offences, Replies, Does, norms, results, nations, Immunities, games. investigations, programmers, complainants, Pleadings, stages, invitations, earners, Charges, sheets. exercise, operandi, progress, formality, matter, transaction. Performed, Was, Referred, Submitted, attended, Entered, Did, Acted, made. Progressing, existing, according, Applying, governing, Amending, Containing, regarding, surrounding, being, counting, Carrying, dealing, taking, going, Doing, hearing. Introduced, Followed, adopted, accepted, involved, Consulted, Allowed, needed, Referred, Submitted, Been, Carried, decided, given, Brought, agreed, Dealt, Happened, laid, taken, defined, Acted, done. occurs, follows, regards, benefits, claims, takes, acts, states, reports, Does. process, processes, procedural, proceeding, prosecution, prosecutions. process, procedural, proceeding, prosecution, hearing. inefficiency, failure, powerlessness, ineffectiveness, uselessness, inutility. The procedure for this appointment has never varied: at the first meeting of the new People's Assembly the Party First Secretary has submitted for approval the list of the new ministers, which invariably has received unanimous approval. emergency procedure, medical procedure, genetic fingerprinting, rule, computing, Bertillon System, fingerprinting, computation, diagnostic procedure, operating procedure, objection, rigmarole, stiffening, experimental procedure, bureaucratic procedure, chromosome mapping, calculation, experimental condition, diagnostic technique, indirection, mapping, formula, red tape, modus operandi, condition, genetic profiling, rigamarole, routine. legal proceeding, proceeding, proceedings, activity, work.